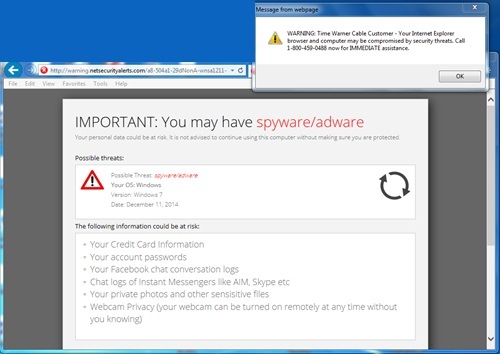 This attack got it "all", and shows how hard it can be for a non ISC reader to evade some of these tech support scams. The URL used, http://login.microsoftlonine.com is only one letter off from the legit Microsoft Office 365 login page (you noticed the extra letter?). The user was redirected to warning.netsecurityalerts.com (the site appears down right now), and to bolster the site's credibility, it displays the user's correct ISP (we all know this is an easy whois lookup, but a user confronted with this message is much more likely to fall for it then a recent message). Calling the 800 number now will lead to a sales system trying to sell you a medial alert button if you are 50 years or older. Ok, since neither domain is, strictly speaking, serving malware, and thus they aren't listed at malwaredomains.com, where can we get a list of domain names that are purely for hosting social-engineering-enabling garbage like this, so that we can block such sites at a proxy server? One letter is out-of-place, but two "edits" are necessary to get to the actual Microsoft site. Both are collecting stats on who loads scripts/css from them.